We’re continuing detox week here at We Heart Food, so tonight we made this light salmon dish as prepared in How To Eat Supper. 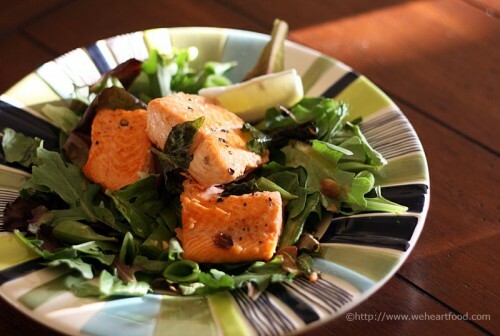 Salmon is pan-roasted with garlic and basil and then placed over a bed of fresh greens. A simple and very quick preparation; the salmon is the star of the show here! This salmon is slammin’. What the — what’re you doing with that bread? Making a Slammin’ Salmon Sandwich, obviously. Obviously. What’s your favorite part of the dish? Gotta be the garlic. Those paper-thin slices just melt on your tongue! Ding ding ding! My only problem is that there aren’t more of them. I really like that you have both the cooked and the fresh basil. I also think this would also be good with some asparagus. Divide the greens between two dinner plates, then scatter the snap peas and 1/2 the basil leaves over them. Rinse the salmon, pat it dry, then salt and pepper both sides of the fish. Set aside. Add enough olive oil to a 12-inch skillet to leave a light film, and heat to medium-high. Add the salmon to the pan and sear for one minute, flip, and sear for another minute on the other side. Sprinkle the garlic and remaining basil around the fish in the pan, lower the heat to medium-low, and cover. Cook for 5-6 minutes, flipping the salmon once, until just done. The fish should be barely opaque in the center. Remove the salmon from the skillet and set aside, keeping warm. Add the wine to the skillet, set the heat to high, and scrape the garlic and basil from the bottom of the pan. Simmer until the juices thicken and sizzle. Drizzle the hot sauce over the greens and top with the salmon. Serve with lemon wedges. This entry was posted on Wednesday, July 9th, 2008 at 9:33 pm	and is filed under How to Eat Supper, Main Dishes, Salads and Light Soups. You can follow any responses to this entry through the RSS 2.0 feed. You can leave a response, or trackback from your own site. I love to toss chunks of grilled salmon into a spinach salad, along with some bits of nectarine. That’s my new favorite summer dinner. Looks delicious. I bet this would be great with some grilled salmon!